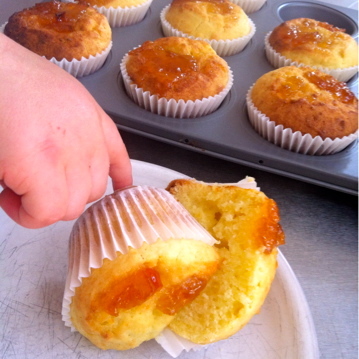 How about a marmalade muffin, muffin? MIL left two great jars of home made marmalade behind when she came to visit and I’m steadily making my way through the thick, fabulously bitter jelly. 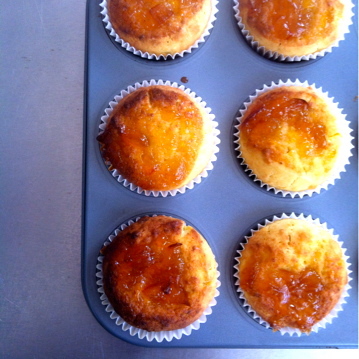 Good glaze for moist, ricotta-laced muffins too! Chuck dry ingredients into a bowl. Combine wet ingredients (rind counts as wet in my book) in a jug or something and add to bowl with dry ingredients. Stir til it barely comes together then spoon into muffin tins (I’m greedy so this mix makes 9 muffins for me). Add a dollop of marmalade on each one. It will spread as the cakes cook. Bake at about 190 for 20 mins or so. They may still seem a tiny bit gooey when warm but cool to a dense crumb so fear not. Just gobble. Likely that a cup of tea will be required too. Yummo! 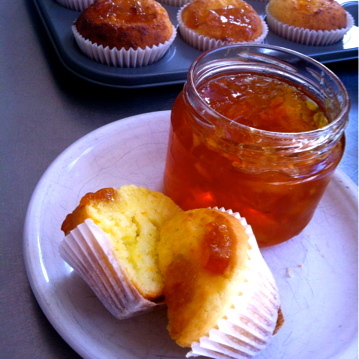 My hubby just came home from work with a jar of colleague-made Marmalade. Delicious.